These examples show how to assess serial correlation by using the Econometric Modeler app. Methods include plotting the autocorrelation function (ACF) and partial autocorrelation function (PACF), and testing for significant lag coefficients using the Ljung-Box Q-test. The data set, which is stored in mlr/examples/econ/Data_Overshort.mat, contains 57 consecutive days of overshorts from a gasoline tank in Colorado. The folder mlr is the value of matlabroot. This example shows how to plot the ACF and PACF of a time series. At the command line, load the Data_Overshort.mat data set. The variable OSHORT appears in the Data Browser, and its time series plot appears in the Time Series Plot(OSHORT) figure window. The series appears to be stationary. 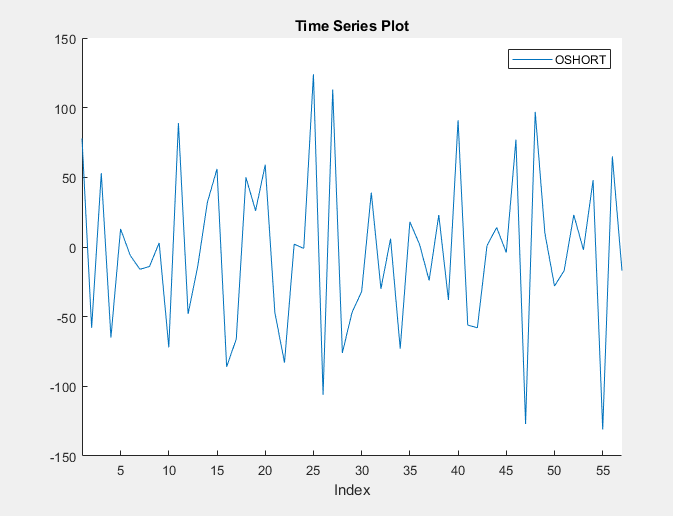 Close the Time Series Plot(OSHORT) figure window. Plot the ACF of OSHORT by clicking the Plots tab. The ACF appears in the ACF(OSHORT) figure window then clicking ACF. Plot the PACF of OSHORT by clicking the Plots tab then clicking PACF. The PACF appears in the PACF(OSHORT) figure window. Position the correlograms so that you can view them at the same time by dragging the PACF(OSHORT) figure window to the bottom of the right pane. The sample ACF and PACF exhibit significant autocorrelation (that is, both contain lags that are more than two standard deviations away from 0). The sample ACF shows that the autocorrelation at lag 1 is significant. The sample PACF shows that the autocorrelations at lags 1, 3, and 4 are significant. The distinct cutoff of the ACF and the more gradual decay of the PACF suggest an MA(1) model might be appropriate for this data. 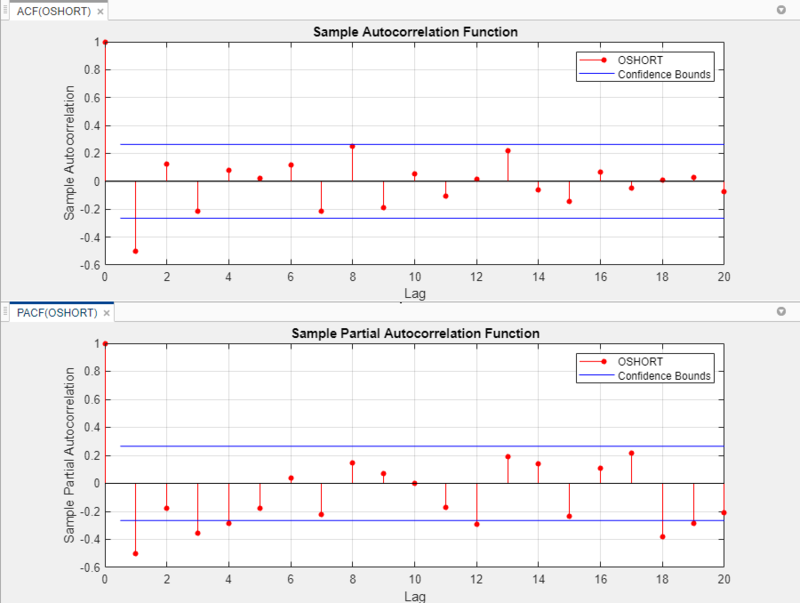 This example shows how to conduct the Ljung-Box Q-test for significant autocorrelation lags. The series appears to be stationary, and it fluctuates around a constant mean. Therefore, you do not need to transform the data before conducting the test. Set Number of Lags to 10. To achieve a false positive rate below 0.05, use the Bonferroni correction to set Significance Level to 0.05/3 = 0.0167. Set Number of Lags to 5 and the DOF to 5. Set Number of Lags to 1 and the DOF to 1. The test results appear in the Results table of the LBQ(OSHORT) document. The results show that not every autocorrelation up to lag 5 (or 10) is zero, indicating volatility clustering in the residual series.